Want your students to “do something” with the shared reading text after shared reading is over? Sure, they can draw or write about the text, but sometimes it’s fun to do something a little different! 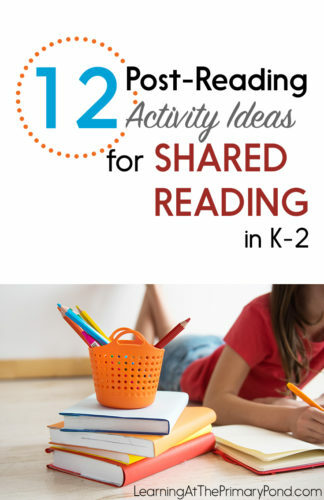 In today’s quick post, I share 12 activities that students can complete after a shared reading experience. Most of these activities work great for literacy centers or Daily Five! 1. Reread the same text! Simple, I know, but primary kiddos love to have a chance to reread the same text that you read during shared reading! Big books are especially fun; let them use your special pointer too! Even if you don’t use big books, try to find multiple copies of the text. If you’re doing shared reading with a poem, it’s even easier to get it into the hands of students. Just make copies and allow them to keep the poems in a folder or independent reading bag! 2. Do an alphabet letter, sight word, or phonics pattern hunt with the text. Again, this is super simple, but practicing letters, sight words, and phonics patterns is even more meaningful when our students do it in the context of a real text. 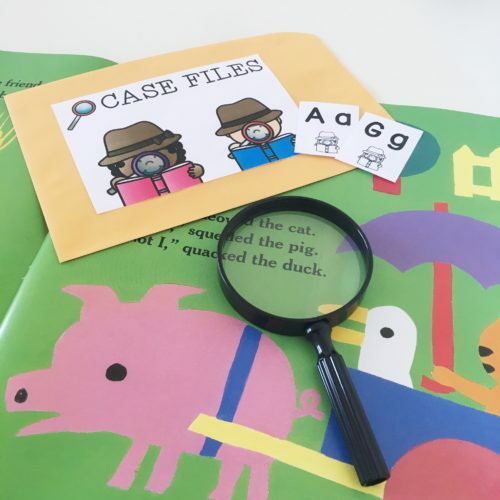 Specify a print feature that students should look for, and use some detective props to make the activity super engaging. 3. Illustrate a poem or text without words. This is a great opportunity for students to demonstrate comprehension of the text! Students can illustrate poems or even nonfiction articles. 4. Perform a Reader’s Theatre version of the text. Any story can be turned into a Reader’s Theatre and performed by your students! You can create the Reader’s Theatre text, the class can work together to create it as a shared writing activity, or students can create them in partners/small groups. Students can then practice and perform their scripts! 5. Sequence pictures to show what happened in the text. Use clipart or photos to have students sequence events in the text. Or have students create their own pictures and then have a friend sequence them! 6. Complete a cloze reading passage activity based on the text. A cloze reading passage is one that has words missing from it. Students have to fill in missing words from a word bank. Let’s say that your shared reading text was about bats. You might use the same facts (or even parts of the actual text) for the cloze reading activity. Bats are nocturnal, which means that they sleep during the _______. At night, they hunt or find food. Bats eat many different things. Some bats ____ fruit. Other bats eat insects. 7. Draw thought or speech bubbles for the characters at various points in the text. This activity is tons of fun AND allows kids to demonstrate their comprehension. 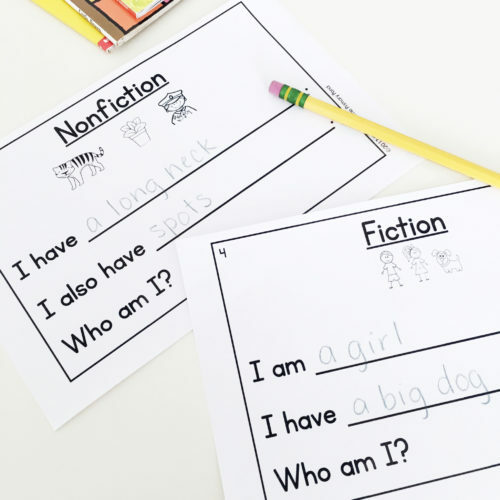 If you are using large enough books, students can take large sticky notes and write thought / speech bubbles for the characters (and then stick them on the actual pages of the text). Or, photocopy specific images from the text (always follow Fair Use guidelines) and have students add thought or speech bubbles. 9. Create additional text features. Once your students have learned about text features, have them “help” an author by adding things like labels, captions, and maps to the texts you read. 10. Write headings for a nonfiction text without headings. This is a great activity for when you’re beginning to teach summarizing, main idea, or main topic! In order to write a heading, students need to understand what a section is mostly about. 12. Read a related text. You can present students with different options for “digging deeper.” This might mean that you provide books by the same author, different version of the same fairy tale, other texts on the same nonfiction topic, or a nonfiction text about something related to the topic of a fictional story. This promotes students’ curiosity and helps them learn to make connections between texts! Create a commercial for the book. Students can create a print or video ad to promote the book. These commercials can be shared with other classes or even posted in the hallway for other students to see. Looking for more shared reading resources? To view my Kindergarten, first grade, or second grade shared reading units (that are brand new!! ), click HERE.